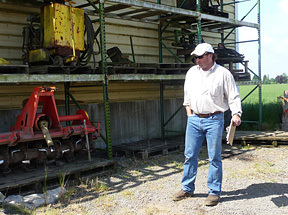 Tom Sweeney surveying equipment inventory prior to planting time at Country Heritage Farms. 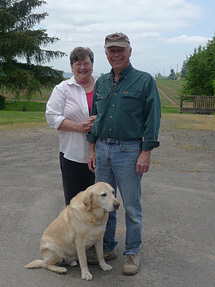 Country Heritage Farms, a third generation, Food Alliance-certified farm operated by the Sweeney family, takes its duty of farming responsibly seriously, always striving for greater sustainability. The diversity of crops that flourish on the farm’s 1700 acres, including hazelnuts, marionberries, sweet corn, green beans, wheat, grass seed, clover, radish seed and cabbage seed, is one reason it has remained viable since its beginnings in 1923. “We are environmentally conscious; we take care of the land. It’s important that we all stay in business,” says Pieper. Inspired by Tom’s father, Sam Sweeney, “the epitome of a conservationist,” the family has set land aside for wetlands, planted conservation trees and constructed nesting poles. They use low-till and no-till operations in the fields whenever possible to prevent erosion and keep the soil from compacting, and as few pesticides as they can get. 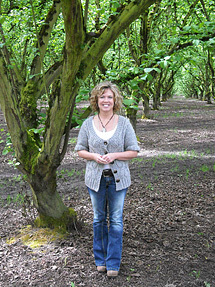 Pieper Sweeney in the Country Heritage Farms hazelnut orchard. Nancy and Sam Sweeney and faithful friend "Dallas". Emergency food box distribution has increased 17 percent since the beginning of the 2007 recession,.